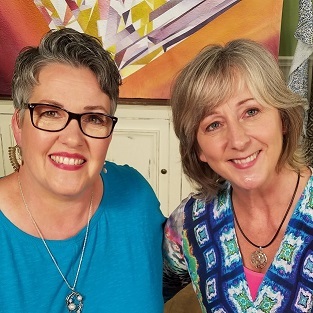 Susan Brubaker Knapp, host of Quilting Arts TV, and me during the taping of Wild-Motion Machine Quilting. 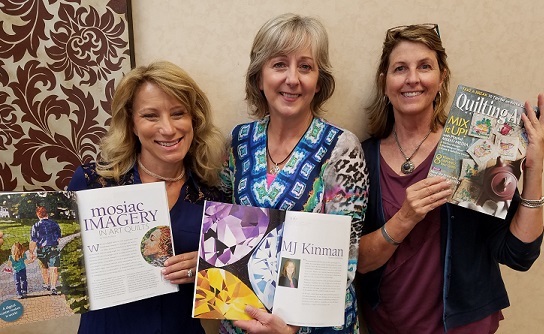 When Susan Brubaker Knapp, host of Quilting Arts TV, invited me to share how I create my diamond quilts with viewers, I was absolutely on Cloud 9. What an honor! After I submitted a few ideas, we agreed on three segments -- Treasure Hunting, Bite-Sized Gems, and Wild-Motion Machine Quilting. During the time leading up to the taping in September, the staff was amazing in helping me and the other guests prepare for our visit. They provided great information about how to share the information in bite-sized segments, how to write it up for the website's information page, what to expect during the taping experience, and travel/lodging information. When the big week arrived, I packed my little SUV with quilts, said good-bye to Louisville, and headed north to Cleveland where they tape Quilting Arts TV at KS Studios in Solon, Ohio. I arrived at the production studio around 4 PM the day before my scheduled taping. The first person I met was the wonderful Katherine Lamancusa. She introduced me to the other guests, showed me around the office and studio, and offered to help with whatever I needed. She made everyone feel comfortable and calm. It was also a great delight to meet all the other artists who were scheduled to tape that week. Some were wrapping up their segments, while others were preparing their materials for the next day. After getting the grand tour, I lugged my quilts and materials into the Green Room and started unpacking. Me in the middle, surrounded by amazing talent -- Heidi Proffetty (on the left) and Libby Williamson (on the right). Lynn Lunoe, segment producer for KS Productions, was the next KS Production person I met. She's the person who makes sure all segments flow smoothly, so an important part of her role is to sit down with each guest and talk with them about what they plan on sharing. She advises on what to cut out and what to elaborate on. I loved her input and advice! She helped me rethink my segments and understand that my role was to give viewers just a taste of my subject matter. We weren't there to teach....we were there to inspire. My "prep tray" for Treasure Hunting...laptop, wireless mouse, readers, and samples. Ready to go! 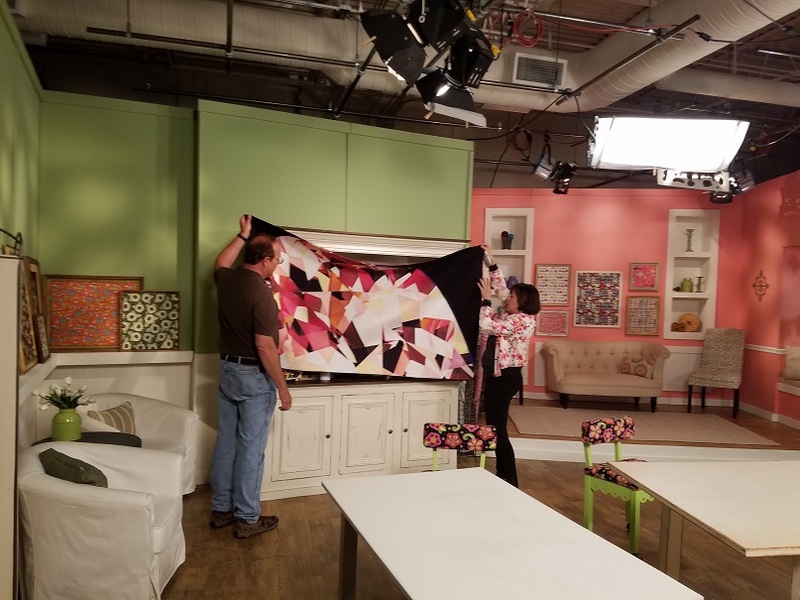 Kathie Stull, owner of KS Productions, hanging my quilt Char #4 on set. The next morning came fast and it was back to the studio for make-up. The last time I had anyone do my make-up was for my wedding day -- 24 years ago. I guess I was due. So much fun! Then, while the talented and lovely Heidi Proffetty taped her segment on creating mosaic quilts, I rehearsed my little spiel, made sure I drank a lot of water, and did some yoga stretching. Lynn had given the green light to my new and improved Treasure Hunting segment, so I was relieved and happy. I spent some of that waiting time chatting with Kristine Lundblad, assistant editor of Quilting Arts Magazine, who does all the editing after the taping is done. She is a gem! Prepping for Treasure Hunting. This is going to be the first segment of the first show of the 2018 season!! Set up for Wild Motion Machine Quilting....I broke a needle in that segment. Walking into the taping studio is like walking into someone's VERY brightly lit quilting studio. And there was Susan! She's lovely, calming, and delightful. She shared a few cues about what would happen if I was gabbing away and needed to wrap it up. And Kathie Stull was amazing. She owns KS Productions. She was in charge of the taping and making sure everything came across just fine. I loved her energy and guidance. And the third segment (Wild-Motion Machine Quilting) was also a ton of fun. We had to stop when I broke a needle on the machine (oops!) Then Susan and I spent some time talking about Char #4, one of my most recent quilts in the Bourbon Diamonds Series. I was able to explain to her how fire is important in the making of bourbon, among other fun things I enjoy about this series. All too soon, it was over and I was done. I hung out with the other guests for awhile and then headed back to my hotel to relax before another dinner out with the whole gang. What a wonderful opportunity to give viewers of Quilting Arts TV a little glimpse into all that I love about making my diamonds. My sincere thanks go out to everyone at Quilting Arts Magazine and KS Productions for a fun and memorable experience!